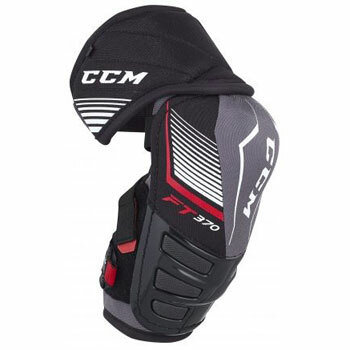 CCM upgraded the FT370 Junior ice hockey elbow this year with new quick-release tabs on the bicep and forearm straps. This allows players to put on or take off the elbow pads with ease since the high-grade velcro can be stubborn at times. Internally, moisture-management is handled by the soft yet durable brushed nylon covering. This sits atop thick medium-density foams that have a memory foam like feel. Jet Speed FT370 Elbow Pads Junior boast full plastic reinforcement throughout, providing a big jump in protection. It features a two-piece construction thanks to the hinged bicep guard, which allows for improved mobility while keeping the padding where it needs to be.